The rake is an unavoidable feature of poker games. It’s the small percentage that the house takes out of each pot and is ultimately the reason that anyone bothers to offer real money cash games at all. In the old days of live poker, it didn’t really matter which individual players contributed how much to the poker rake; if anybody thought about this subject at all, they probably would have concluded that the entire table paid it together. The rake in poker rooms online, however, must be attributed to each player somehow. This is because it’s the key to determining payments for rakeback, bonuses, VIP programs and the other incentives that internet-based cardrooms offer their clients. There are several distinct methods for assigning rake generated to specific players at a table, and the way it’s done at your site could have an impact on how beneficial online poker rakeback and other promotions are for you personally. This is probably the simplest procedure to understand. In dealt rake, everyone who received cards in a hand is credited equally. So in a nine-handed game, if $1.80 is raked from the pot, then everyone dealt into the hand is calculated as having put in $0.20 toward the house’s cut. Your style of play has little influence on your assigned totals because you’ll be treated the same whether you called down all the way to the river or folded preflop. The dealt poker rake methodology favors players who are tighter than average because they’ll receive the same rakeback and other advantages as the craziest maniac. Dealt equations were once pretty popular, but now most rooms have moved on to other means of assigning rake to players. One of the few poker providers that still uses the dealt formula is the Horizon Network and its leading site, Intertops. Under the contributed rake scheme – also called average contributed or shared contributed – only players who put money into the pot are considered as having generated poker rake. It doesn’t matter how many chips a player actually places in the middle because the total rake is divided up evenly among everyone who put any amount of money, however tiny, into the pot. Most of the rooms that used to employ contributed calculations, like Betfair, have changed over to other systems. However, there are still many promotions of the form “Play X raked hands to get Y free,” which essentially operate using a contributed model. Contributed attribution is beneficial to loose players who see many flops whether or not they then proceed to wager on later streets. It’s also great for players of stud and other games where antes are used because virtually every hand qualifies fully. A refinement of normal contributed rake, the weighted contributed approach assigns rake paid based on the percentage of the pot each player is responsible for. For example, if someone posts a $1 blind but folds without committing any more money, and two other players each put in $4.50 apiece for a total pot of $10, then the individual who folded his blind will only get credit for 1/10 = 10% of the poker rake taken for the hand. The other two players who contributed $4.50 each will both get assigned 45% of it apiece. This is by far the most popular calculation method in use today. It has been adopted by Black Chip Poker, BetOnline, and PartyPoker among other rooms. Weighted contributed programs are widely held to be the fairest way to calculate rake generation because they deliver rewards at rates roughly corresponding to how much a player puts at risk. Winning players are understandably underwhelmed by it though because they tend to avoid hazarding their entire stacks when the situation is unfavorable. Snug, careful players do poorly under weighted contributed regimes, but loose, action players perform well in these metrics. According to some schools of thought, the rake is paid exclusively by the winner of a hand because he’s the one who would have received the entire pot were the rake not lifted from it. So the winner is judged to be the only raker in a hand, and the others are assigned $0 for the purposes of RB and site loyalty programs. Very few online poker sites subscribe to this philosophy. One of the rooms that did deploy a WTA VIP program is the now-closed, Nevada-licensed Ultimate Poker. At first glance, it may appear that winner-takes-all computations are great for skilled players. After all, they win a lot and therefore should see significant returns from all the pots they drag. But we must bear in mind that a savvy poker player wins a lot of money, not necessarily a lot of pots. WTA rake structures actually promote players who see too many showdowns or bluff relentlessly to try to take down as many pots as possible. In recent years, poker site managers have discovered that fish tend to see their deposits gobbled up by their more adept adversaries, who then make withdrawals. This is believed to be bad for the poker economy because professional pokerists are effectively taking money out of circulation, and there’s no guarantee that a busted losing player will redeposit again. In order to keep funds moving from person to person (and not coincidentally increasing total poker revenue at the same time), sites have implemented programs that attempt to divert rakeback and other rewards toward the more untutored players. This is achieved by combining traditional rake assignment techniques with other factors intended to give a helping hand to recreational poker fans. Within iPoker Network’s Real Player Value framework, half of the rake sum connected to a player is determined by a weighted contributed approach, but the other half is governed by something called Source Based Rake. Basically, it tracks who actually deposits money and acknowledges them as being the ultimate originator of the dollars raked by subsequent users of “their” money. Part-timers, crossover sports bettors, and others with poor poker proficiency are the major beneficiaries of Real Player Value while rakeback grinders and net withdrawing players lose some of their rewards. The particular calculations used at each poker room are good or bad for different types of players, so we can't say for sure that one method is superior to another. Tighter players tend to do quite well under dealt rake schemes while looser individuals are credited with more rake attribution under average contributed and weighted contributed methodologies. 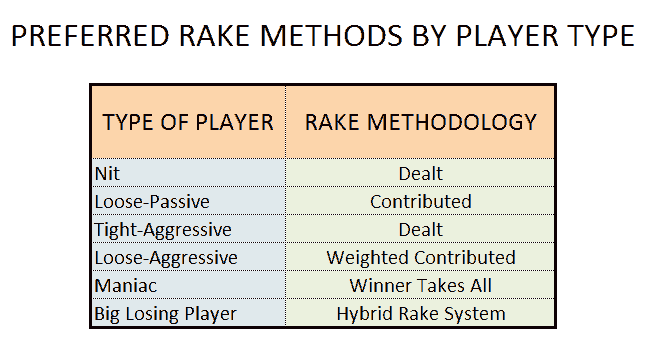 As we move along the spectrum toward a more aggressive and gambling style of play, weighted contributed dominates as the preferred rake measurement system. The craziest maniacs are rewarded handsomely by winner-takes-all programs because it's not whether you win or lose, it's how many pots you drag that matters. Finally, the newest type of rake assignment philosophy is a hybrid between traditional rake calcs and other factors intended to better represent the impact that each player has on the poker ecosystem. These equations favor losing players more than anybody else, so there's not one specific poker strategy that's rewarded or punished. We can say, however, that tigher players are most unlikely to lose enough to see much benefit from these hybrid arrangements. Get 36% dealt rakeback with an additional 24% available through the 200% up to $1,000 first deposit bonus. Intertops is preferred by tighter players especially full-ring enthusiasts. Read our Intertops review to learn how to sign up. Open to all American states, except Kentucky, and most countries around the world! The 20% weighted contributed rakeback at ACR is supplemented by an extra ~15% while the 100% up to $1,000 welcome bonus is active. It’s good for those who play a loose, aggressive style. Check out our Americas Cardroom review for all the details. U.S. players are welcome as are ROTW poker lovers! International players looking for “old style” weighted contributed rakeback on the iPoker network rather than the controversial RPV system can enjoy our 35% deal. There’s another 20% to be had at Betfair from the 200% up to €1,000 new player bonus plus 10% more from the monthly “Bank Job” points chases. Hit up our Betfair review for more info.